Our Help program is now working again. I got our recipe program back again but have to say that I've decided not to make use of it as it would take a lot of work to make it a worthwhile resource and there are really some very good ones on Google. I have placed an order for an upgrade to this program and purchased an install option so I hope this will be working by next week. As to the Arcade in the community. The software company isn't offering any support anymore so this might be an issue in getting it working again but trying to contact Steve to see if he had a copy of the folder we are missing. Printer Friendly.. we got this working on a test page but somehow it got overwritten so we're still working on this. The bill, lodged by Green MSP John Finnie, has been backed by the government and looks certain to pass. The Institution of Civil Engineers (ICE) in Scotland celebrates its 200th anniversary this year, the organisation is keen to open our eyes to the innovations its unsung heroes have helped to design, create and continue to maintain. THE sooner we leave the European Union the better. That is the conclusion I have reached after talking to my granddaughter, 26, who is soon to embark on a career as a fully-fledged GP. This initiative will allow for more Canadians to see the painting in person and is meant to honour and pay tribute to Her Majesty’s ongoing and unwavering service. The reemergence of lost words - like splorrach, clawscrunt and gralloch - would have delighted Scotland’s lexicographical pioneers, writes Martyn McLaughlin. A new batch of contingency planning documents has been released by the government. The paper, The Border between Northern Ireland and the Republic of Ireland post-Brexit, reminds us that both the UK and EU have committed to introduce no new physical infrastructure at the border. Seafood fraud is a global problem that hurts our health, our wallets and our oceans. A 2016 review of more than 200 published studies from 55 countries found that one in five seafood samples were mislabelled. By J.C.H. Gill, M.B.E., B.A., LL.B., F.R.Hist.S.Q. A great defender of the native people in Australia. The Complete Guide by Economists for Free Trade and published this week to explore what an agreement with the EU on doing a no deal under WTO terms. By the European Research Group (pdf) which explores how the border between N. Ireland and Ireland can be handled post Brexit. 24 August 2018 - Intelligent Growth Solutions Ltd (IGS), the Scottish-based agritech business, has today unveiled its first indoor vertical farming demonstration facility. Based at the James Hutton Institute, Perthshire, it is arguably the world’s most technically advanced indoor farm. The IGS facility utilises its ground-breaking, patented power and communications technologies to address the key challenges facing the indoor farming industry. Fundamental barriers of cost of power and labour have inhibited the sector’s expansion to date, as well as the inability to produce consistent and quality produce at scale. The IGS technology has been designed to overcome these barriers and significantly lower the cost of production overall. With global market growth predicted at 24 per cent over the next three years, the opportunities for IGS are substantial, with over 95 per cent of its technology solutions expected to be exported. IGS will not be producing crops for sale, but will be collaborating with growers, retailers and international organisations to deliver the hardware and software platforms to revolutionise indoor growing environments. Approximately 150 jobs are expected to be created by 2021 in areas such as software, data, engineering, robotics and automation. Significant demand is already being realised amongst growers, retailers and national governments aiming to address food security issues and alternative methods of production in their regions. Vertical farming offers huge reductions in water wastage, the elimination of the use of pesticides and a huge reduction in food miles. It allows produce to be grown locally and on demand, which could reduce fresh food waste by up to 90 per cent. The Scottish-led team at IGS has developed, patented and productised a breakthrough, IOT-enabled power and communications platform consisting of patented electrical, electronic and mechanical technologies. All this is managed by a SaaS & data platform using AI to deliver economic and operational benefits to indoor growing environments across the globe. This technical solution enables the reduction of energy usage by 50 per cent and labour costs by 80 per cent when compared with other indoor growing environments. It also can produce yields of up to 200 per cent more than that of a traditional greenhouse. David Farquhar, CEO of IGS commented: “The opportunity to unveil Scotland’s first vertical farm, and arguably the world’s most technically advanced indoor facility, is a hugely exciting one for the whole team. As a Scottish-founded and led team we have captured horticultural, engineering and software skills from within Scotland to make this business flourish. “The global horticulture market is crying out for new approaches to enhancing food production in terms of yield, quality and consistency. It is also searching for ways to reduce power consumption and labour costs and our technology has been designed to fundamentally address this. The location of IGS’ first vertical farm at the James Hutton Institute, a world leading crop research facility, was deliberately chosen to enhance collaboration opportunities. Scientists and researchers at the Institute will be working with the team at IGS to better understand how growing under lights can impact different varieties of crop growth, as well as drive increased productivity. Professor Colin Campbell, CEO of James Hutton Institute commented: “There have been fantastic synergies coming out of the combination of the IGS technologies and Hutton’s cutting-edge plant science and collaboration. There are genuine potential game-changing opportunities both for new and conventional horticultural and agricultural systems that can come from our collaboration. 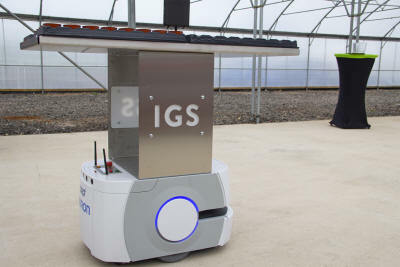 IGS was established in 2013 as an indoor horticulture business with a vision to deliver commercial viability to the vertical farming model by improving productivity - yield, quality and consistency - whilst dramatically driving down the cost of power and labour through Total Controlled Environment Agriculture (TCEA). John Swinney, MSP for Perthshire North and Deputy First Minister of Scotland unveiled the plaque to mark the official launch of Scotland’s first vertical farm. IGS was formed in 2013 www.intelligentgrowthsolutions.com. Its purpose was to bring indoor horticulture to commercial reality by combining efficient internet-enabled smart lighting with automation and power management. The founders’ experience combined extensive knowledge of horticulture, industrial automation and big data. It launched its first indoor vertical demonstration facility in August 2018. David Farquhar was appointed CEO of IGS in November 2017. A seasoned transformation and business growth technology entrepreneur, he joined the company to drive its global expansion and raise its next funding round. Just want to wish our friends in the Carolinas and Virginia all the best in surviving Hurricane Florence.